It’s amazing how production has held up and even increased despite low gas prices. Production declines have shown up only at the beginning of this year, even though prices have been below $3.00 since January 2015. 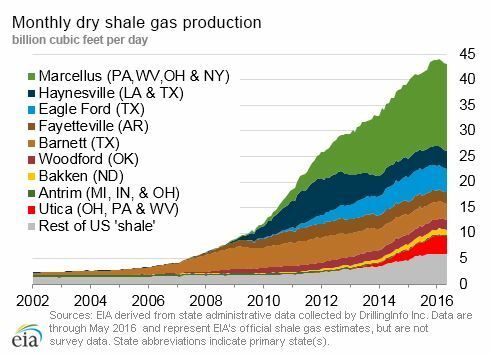 Arthur Berman, a geological consultant, has once again blasted the economics of gas shale plays — this time the Marcellus. At the annual conference sponsored by the Association for the Study of Peak Oil & Gas – USA, held on October 7-9 in Washington, D.C., Mr. Berman made a presentation: “Shale Gas–Abundance or Mirage? Why the Marcellus Shale Will Disappoint Expectations.” His power-point from that presentation may be found here: Arthur Berman on Marcellus.pdf Mr. Berman argues that only a small percentage of the areas now being touted as productive in shale plays — the “core areas” are economic at any price; that even within the core areas, performance is not uniform and the geology is complex; that the wells are very expensive and the break-even gas price is as high as $8-$12/mcf; that reserves have been overstated by the companies in the plays; that the industry is not properly estimating estimated ultimate recoveries from the wells; that changes in reporting rules recently adopted by the Securities and Exchange Commission allow companies to “book” estimated reserves prematurely; and that the economies of the plays will ultimately be reflected in lower share prices of the companies participating in the plays. For the Marcellus in particular, Mr. Berman asserts that infrastructure limitations — lack of pipeline and gas processing capacity — will slow development, that environmental issues — fears about groundwater contamination, proximity to urban areas, and regulatory restraints — will not go away, and that economics for drilling in the Marcellus Shale are no better than in the Barnett Shale. Mr. Berman says that shale gas is the nation’s next speculative bubble likely to burst. Mr. Berman created a stir just a year ago when he published a similar gloomy analysis of the Barnett Shale, at the ASPO conference in October 2009. At that time he was a contributor to a trade publication called World Oil, which is sent free to top oil & gas E&P executives. In early November 2009, World Oil was about to publish another article by Mr. Berman critical of shale plays, but the president of the publication ordered that it not be published. Mr. Berman resigned, and his editor Perry Fischer, who insisted that the article be published, was fired. All of this created a stir in the blogosphere. Fischer contended that World Oil executives were pressured by CEOs of two public E&P companies not to publish any more of Mr. Berman’s critiques. Tudor Holt & Pickering, who analyze the oil and gas industry, published a critique of Mr. Berman’s analysis, and two oil executives from Devon and Chesapeake wrote newspaper op ed pieces critical of his work. Chesapeake CEO Aubrey McClendon said at the time that he expected gas prices to continue to rise, which would lead to an increase in drilling and production in the shale plays. 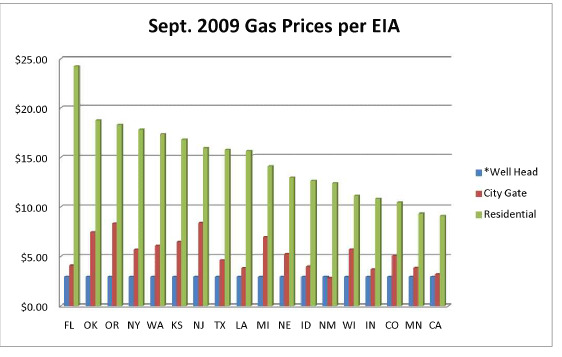 “We think all of the elements are in place for gas prices to be higher in 2010 than they are today,” McClendon said. Below is the same information in graph form. 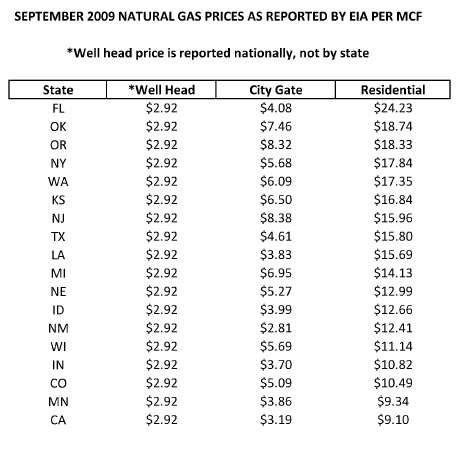 Why would average residential gas prices in Texas be $12.88 per mcf, while residential prices in California and Minnesota — far from natural gas production — be less than $10 per mcf? Why such variations in Residential prices? On August 14, futures for September delivery settled at $3.24/MMBtu, a 52-week low. Futures prices have declined about 65% from this time a year ago. The Energy Information Administration reports that gas in storage increased by 63 Bcf to 3.152 Tcf for the week ended August 7, compared to 2.65 Tcf a year ago, and well above the five-year average of 2.635 Bcf. Absent severe supply disruptions or a very cold winter, gas prices are likely to remain low for some time. 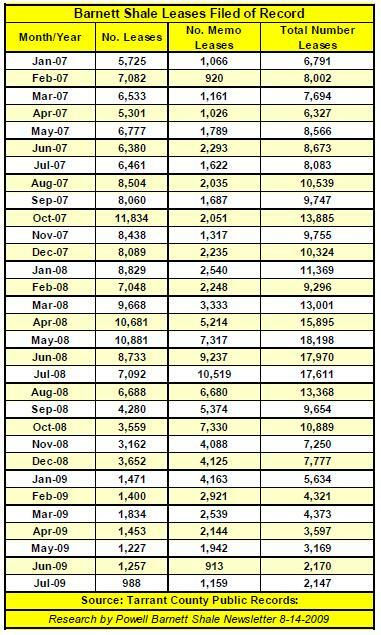 This shows a decline in leasing from 18,000 leases in May, 2008, the height of the leasing frenzy, to 2,000 in July 2009. Earthquakes: Scientists from Southern Methodist University have tentatively concluded that recent earthquakes in the vicinity of Dallas-Fort Worth Airport may have been caused by a salt water disposal well located at the southern end of the airport, operated by Chesapeake. Sources and Users of Energy in the U.S. The sources of energy are on the left, the sectors of the economy that consume energy are on the right. 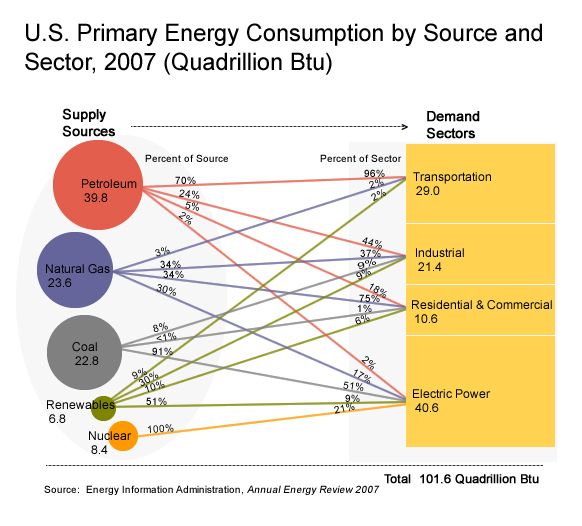 The lines connecting supply sources and demand sectors show which sectors use which sources of energy. For example, petroleum represents 39.8% of the total supply of energy in the U.S. Seventy percent of that petroleum is used for transportation. Petroleum is the source of 96% of all sources of energy for the transportation sector. The transportation sector consumes 29% of all energy consumed in the U.S. The chart reveals how natural gas is used in the U.S.: 34% in the industrial sector, 34% in the residential and commercial sector (as fuel to heat and cool homes and buildings), 30% to generate electricity. Most electricity is used by residential and commercial buildings, so in reality electricity is an intermediate demand sector. If it is eliminated as a demand sector, 61% of total demand would show as consumed by residential and commercial buildings. Natural gas would supply 14.8% of total energy used in residential and commercial buildings, either directly for heating and cooling or indirectly through its use to generate electricity. The Energy Information Administration has revised its forecast for 2009 U.S. industrial natural gas demand, to decline by 7.4% this year. It predicts total natural gas consumption to fall 1.8% in 2009. U.S. natural gas production is expected to decline 0.3% in 2009, and to slip 1% in 2010. 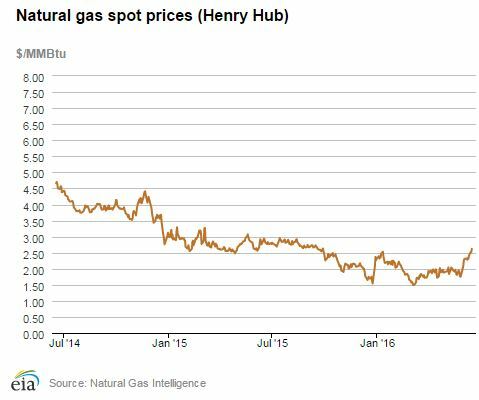 EIA predicts natural gas Henry Hub prices to average $4.24/mcf in 2009 and $5.83/mcf in 2010, compared with $9.13/mcf in 2008. Chesapeake Energy has elected to further curtail its gas production, by a total of 400 mmcf in 2009, representing approximately 13% of Chesapeake’s production capacity.